EasyMarkets is a trading website which offers a variety of easy-to-use platforms for online trading. 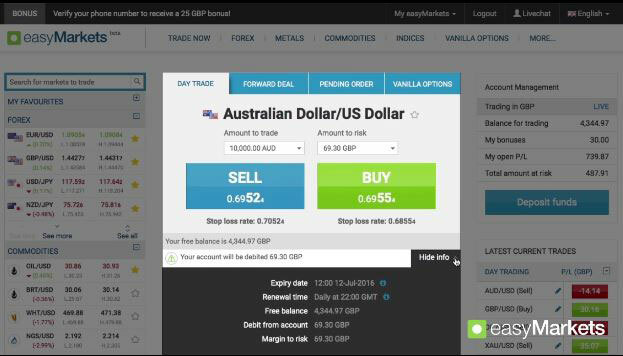 You can trade in a wide range of markets, from Forex to Commodities, with Vanilla Options and CFDs on offer. The site also provides online training tools for new and seasoned traders who wish to better understand the markets and improve your chances of success. As with all online trading, it’s important to remember that you can lose money whilst using these services. Better understand the markets and improve your chances of success. We were particularly impressed by easyMarkets.com’s online learning options. A large selection of educational videos are available free of charge, helping to improve the skills and knowledge of all users. The “What is Forex?” videos, for example, will help you to better understand the basics and intricacies of how Forex currency markets function, whilst the “How to...” playlists provide ample support to allow you to use the free trading platforms to their utmost. If in doubt, the team offer live chat support, so you can get instant answers to your most probing questions. If you want to try your hand at trading, but don’t want the risk of losses initially, you can sign up for a free demo account. This provides an opportunity to try out your tactics on the markets and discover whether your decisions would have made you money. There are also free eBooks and trading simulators, as well as plenty of articles to read. The site’s Forex glossary is also a handy page to visit, full of simple explanations for complex trading terms. Webinars, seminars, expos and other events are arranged so you can discuss current topics, get tips and learn from your fellow traders. EasyMarkets.com holds regular promotions and offers. They also provide several important trading tools for users, including live currency rates, trading hour lists, analysis centres, charts, financial calendars, dealing rooms, SMS alert services and more. All combined, these are some invaluable tools which we advise checking out, as you could be at a disadvantage without them. Free guaranteed Stop Loss can also help you to prevent large losses automatically. Free guaranteed Stop Loss can also help you to prevent large losses automatically, since you can set your limits and choose to sell before they are reached. Another very interesting feature is the “deal cancellation” which allows you to cancel any losing trades within the first hour and recover all losses, so you can take big punts on trades without immediate risk. A user-friendly interface for web trading. The site’s trading platforms are also worth mentioning. These are well designed and easy to use, for beginners and regular traders alike. Whether you’re in the office, at home, commuting or just want to check up on your trades from a mobile phone, all options are viable here. 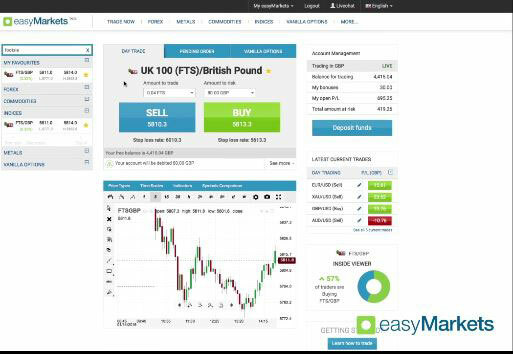 Easy Markets offers web, desktop and mobile options, with MetaTrader 4 available. This service offers some of the best Forex options around, with high liquidity. You can choose from Exotics and Crosses, Minors and Majors, as Spot trades, Forwards and Options, giving you the control over how you trade in currencies. You can trade up to 5 days a week for 24 hours each day, and the site provides upfront costs with tight, fixed spreads. Stop Loss is also available so you can manage your risk carefully. Vanilla options are available with many Forex pairs and commodities. These options allow you to benefit from rising and falling market trends, without being obligated to buy or sell. As such, your financial risk is limited to the amount you’ve paid in premiums. You can also create your own strategies or check out the strategies marketplace to adopt techniques from specialists. Contracts for Difference offer a simple means of cash-settled trading without the need to own the commodity you’re investing in. You can profit from market shifts, making quick contract deals using EasyMarkets.com's' trading platforms, which offers a broad selection of commodities and indices. They also offer competitive fixed spreads and guaranteed stops, with more than 70 currency pairs, 15 indices, 5 metals and energies, and 7 agricultural commodities. If you look around several online trading websites, you’ll notice that EasyMarkets offers more commodity trades than most. Metals include the usual gold, silver and copper, but also palladium and platinum. Meanwhile, energy commodities cover a range of oil and gas options, and there are 7 agricultural options (including cocoa, soy, cotton and wheat) with fixed spreads. For those of you wanting to try the stock markets, you can explore a variety of options across the globe, including the big hitters such as the US, Asia and Europe, as well as emerging markets. The various trading platforms provide instant updates on fluctuations on Indices markets, identifying the percentage changes so you can make informed decisions on trades. Identify Indices changes and make quick, easy trades. 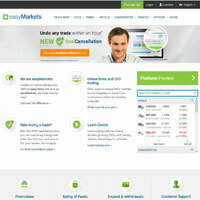 EasyMarkets is true to its name, providing easy-use platforms for trading online. They also provide more commodities options than a few other trading services, as well as stop-loss tools and 1 hour guarantees on purchases which make a loss. With a range of learning tools, fixed spreads and more, this site feels particularly suited to traders who are just starting out and don’t want to risk losing a lot of money (though that is, of course, still a real possibility). If this sounds like you, why not try out the website’s free demo account to find out how you might perform with real investments?